This is the Almond Cookie Bar that I made last weekend. I scribbled down the recipe on a memo pad many years ago, put it in my folder and had completely forgotten from where did I get this recipe. If anyone of you know the link of this recipe please let me know. 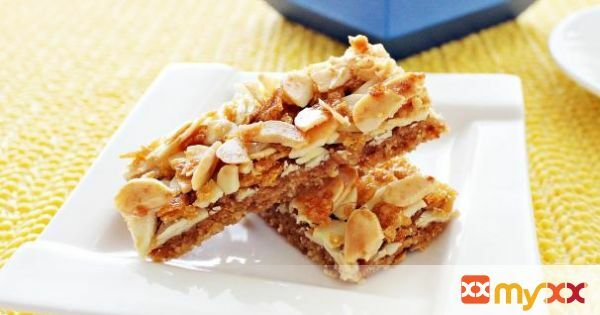 This Almond Cookie Bar is really worth trying and addictive as it's very crispy and fragrant with every bite that makes me reaching out for more. Definitely a keeper! I should have doubled the recipe so that I can have more to share with my family and friends. 1. Beat butter and sugar until light and fluffy. 2. In a bowl combine wholemeal flour and plain flour together, then mix in the butter mixture with a rubber spatula and knead gently to a soft dough. 3. Turn out the dough on to a flour surface or line with a plastic sheet below and with another plastic sheet on top. 4. Then roll to a square. 5. Chill for at least 1 hour. 6. Transfer the dough on a non grease paper and cover with a plastic sheet on top. 7. Then roll to dough to about 3mm thick. 8. Prick the dough with a fork and bake for about 15-18 minutes until brown at preheated oven 180C and leave biscuit to cool. 9. Spread the apricot jam over the top of the biscuit, set aside. 10. Mix topping ingredients and spread evenly on the biscuit with a palette knife. 11. Bake for 15 minutes until golden. 12. Remove cooked biscuit from the oven and leave to cool completely, then cut into bars.